Food allergies and eczema affect every aspect of one's life. For people with an allergy to something like soy, you not only have to look out for things you eat or drink, but anything you touch. I became a makeup-artist soon after high school and continued to work in the cosmetics industry for about thirteen years. During those last few years, the trend of companies using soy as a filler and turning it into everything from crayons to foam carried over into the cosmetics world and soon, soy was turned into many various chemicals used to do practically every conceivable thing under the sun, including binding, preserving, texturizing, thickening and of course as a filler so companies could get more bang for their buck. The list of soy derivatives used for cosmetics and beauty products is literally exhausting and new 'ingredients' are developed and will continue to be for as long as the soy crop continues to be planted and sold for dirt cheap. Is there silicone in your face products? Add to this the fact that I am severely allergic to dimethicone and silicone derivatives; a discovery which started back in the late 90s when I first applied the new and exciting Colorstay lipsticks and makeup by Revlon. Having oily skin, I was their target demographic of a teenager who just didn't want her makeup coming off after 3rd period, but little did I know which ingredient was actually causing the reaction until years later. Over the years, allergic reactions to makeup were hit or miss and my biggest wake-up call to this allergy was when face primers were first introduced to the public. For those of you who don't know, a primer is a base used before the foundation makeup. The silicone microspheres have a silky, slippery-smooth feel which also softens the look of very fine lines and pores. It is this immediate visual gratification that caused many skincare companies to jump on the silicone bandwagon.The first really well-known silicone-based primer was introduced by Smashbox and many other companies soon followed suit. In hair products, it 'smoothes' down the frayed cuticle giving it a smooth outer surface under a microscope like we used to see in those old Infusium and Pantene ads. People think nothing of using all these products on a daily basis, but are they really safe? We know that dimethicone is a silicone derivative. It is used as an emollient, skin protectant (since it forms a clear barrier, (basically suffocating the skin) and keeping any moisture bound underneath. But of course, I figured I'd entertain myself and ask another question. Is this same silicone ingredient going on people's faces, in their hair and in their skin the same exact material that makes up silicone gel breast implants? The answer is YES. Dimethicone's scientific term is polydimethylsiloxane also known as PDMS. This is the same filler used in silicone gel breast implants and a few minutes of reading about its toxic effects on the body makes one wonder, what is this stuff doing when I apply it all over my body every day? Or worse, to open/broken skin? Right now, it has a slightly low rating (3) on Environmental Working Group's Skin Deep website for toxicity, but this is not taking into consideration the vast amount of people with severe skin disorders like psoriasis and eczema who are putting it on broken, open skin. I started realizing that whenever I applied this primer, my face would start to itch. Then as the day would progress, the itching would become much more intense and even after washing my face the itch would continue for days! Silicone does not easily wash off; since the particles are so fine, it hangs on to cracks, crevices and dry areas. Having to use these products on clients, my hand eczema would act up and although I would try to avoid using the likely culprit, there were just so many products and ingredients popping up all the time, allergens became hard to avoid. 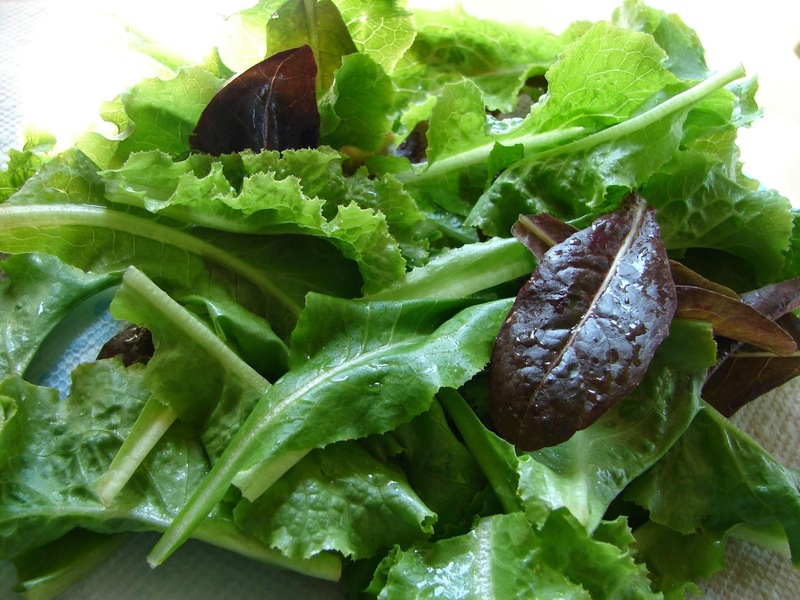 Fresh organic salads do more for your complexion than any primer can! Now dimethicone derivatives and soy are used in higher concentrations in practically everything; foundations, lipsticks, eyeliners, hair products and even powder eyeshadows! It is revered in powder eyeshadows, because it lends an almost airbrushed look to the application and also makes the color adhere better to the skin. The unpredictability of contact dermatitis in such a risky setting made me realize I needed a career change. So I left the industry and decided to pursue a career as a portrait artist and writer. But as I'm sure you know, building any business and becoming independent will take time. But for now, there are plenty of resources for those of you in similar situations who have some free time to learn a new trade. I'm currently taking French and having a great time doing it, in between writing and working on portraits! Learn a new language with interactive prompts and mini tests that drill the words into your brain for FREE at Duolingo. Although Duolingo won't make you fluent, it gives you the basics and a good foundation to move on to harder learning programs and continuing on to free programs like Memrise or buying a full course like Rosetta Stone . If those don't pique your interest, maybe something on this list will. The point is, if you have free time, there are tons of productive ways to utilize that time...maybe even into a new future vocation! Don't let circumstances get you down, because most of the time, those circumstances are only temporary. Don't focus on what you can't do anymore; focus on what you can and do what you are most passionate about. Because in the end, its those things you are most passionate about which will garner you the most success because they are something you actually enjoy doing. These things are the 'Vein of Gold' Julia Cameron talks about in an amazing book I read a long time ago called The Artist's Way . Hopefully if you haven't found your 'vein of gold' you will try to. It is never too late to be the person you were meant to be. Maya, can't thank you enough. Thought it was just me. I have normal skin that goes dry in winter, very oily and acne prone spring to summer. I can't use primers, most oil free moisturizers have so much silicone in them even organic brands I just break out bright red like a Hummel doll and get tons of acne. I have very sensitive skin have since a girl and now in my 30's. So far even though not oil free the best silicone free budget moisturizer I've found is kiss my face fragrance free olive and aloe. I mix a squirt with a few drops water and smooth on my skin. Really calms it down. And makeup goes on smooth. Desert essence makes a silicone free one too but it has alcohol in it which can be an issue for some, Jason's vitamin e is good but only in extreme cold weather it's very rich for the rest of the year.I do feel your dilemma! Thank you. I'm not alone. You know, you might be able to find a niche as an allergen-free makeup artist...I know that for special occasions I'd like to have my makeup done, but I'm stuck doing my own however well I can because I can't trust the products and tools someone else would use. Yes, I've definitely thought about it, but due to the expense of the makeup as well as the strong possibility of lawsuits/headaches from reactions, I decided not to go there. The niche for this genre could definitely be lucrative but more for a cosmetics line since allergic people are scattered all over the world. I did venture into this, but realized startup costs for both or even just building my kit as a gluten-free allergen-free makeup-artist would be extremely high with not enough return because very few people in Long Island who are getting married have severe food allergies and skin sensitivities. Also, after doing it for so long, it bores me. I would, however, consider doing YouTube makeup-artistry tutorials for people specifically with food allergies and gluten sensitivity...that has def crossed my mind..
Do you know of any soy free face primers? I wish I did. Unfortunately, your best bet is probably to make your own. Depending on the type of primer you want, this actually can be pretty simple. Just add a few tablespoons of soy-free Glycerin (I buy Starwest Botanicals brand which as of last year was coconut-derived but double-check to be sure) to a spray bottle of DISTILLED water and maybe two drops of organic tea tree oil to preserve it. This is actually very similar to the ingredients in Urban Decay's or MAC'S liquid primers (except without the dimethicone) although I have yet to test it, so it's at your own risk. If you want to really recreate the ones in the store, simply buy the liquid dimethicone from www.makingcosmetics.com. =) Hope that helps and thank you for stopping by! I just read your article about your (soy and) dimethicone allergy. I have a few questions for you: has it ever been tested that you have a silicone allergy? I myself think I have an allergy for dimethicone too. Recently I had a series of allergy tests. Nothing from the standard test came back positive, but I did seem to have allergies to some kinds of shampoos and other cosmetic products. Now I compared the ingredients and the one factor they have in common, is dimethicone. This is something that I can't find on the list of the things tested in the standard test and was not an ingredient of the products I did'nt test positive on.